Instead of spending your Sundays meal prepping a week’s worth of recipes for your new diet of choice (Paleo? Whole30? Japanese Paper Diet? ), eat deliciously at these 16 healthy restaurants—from grab-and-go lunch spots to proper sit-down affairs—that will help you keep your resolutions and free time intact. We never expected one of our favorite sushi spots to be entirely fish-free, but here we are. This plant-based chain, with five grab-and-go locations and one full-service restaurant, specializes in rolls, rice-paper wraps, dumplings and noodle dishes that put nutrient-packed ingredients front and center. Think black rice, coffee-roasted kabocha squash and saffron chickpea puree. Chill out in the laid-back desert oasis that is Dez, chef Eden Grinshpan’s debut restaurant in Nolita. The menu features Grinshpan’s take on classic (and customizable to any healthy regimen) Middle Eastern cuisine: Think carrot meze with harissa, honey and labneh, Instagrammable pink beet hummus, sabich salad and falafel cauliflower pita, to name a few. This quirky Scandinavian-inspired fast-casual spot is entirely dairy-free and USDA-certified organic, plus it uses low-glycemic bread for its sandwiches (the wild caught salmon with vegan cream “cheese” tastes as good as an old-school bagel and lox). Breakfast includes cinnamon rolls made from almond meal, quinoa porridge and probiotic coconut yogurt. Plus, if a juice cleanse is your thing this year, you can currently nab a free upgrade on the house line of detox elixirs. Craving Indian food? Indulge at Inday, an entirely gluten-free café in Flatiron with build-your-own bowls. Laden with flavor-packed sauces like charcoal eggplant and red curry, the bowls are packed to the brim with veggies like beets, squash and cauliflower “rice.” Don’t skip the Avo Cocoa for dessert, a decadent dairy-free whipped chocolate mousse made with dark cacao, avocado and coconut milk. Check out the plant-based stir-fries at Honeygrow (and its quick-serve spin-off, Minigrow), made from egg white or whole-wheat noodles alongside all-natural, antibiotic and hormone-free proteins. We can’t get enough of the sesame-garlic noodles or the sweet soy five spice, a hefty brown rice bowl with togarashi-spiced turkey, green beans and red onions. Not every healthy spot has to be fast-casual or a salad bar. Take this nook under the High Line, where healthy comes with table service in a cozy aesthetic. Feast on the buckwheat pancakes with wildflower honey, orange, fresh berries and turmeric butter over breakfast or nosh on the walnut pâté with cashew cheese, raw vegetables and toast at dinner. Aside from an interior that’s basically Instagram fever dream (neon lights, palm tree leaf wallpaper, beachy porch swing), this trendy spot’s main draw is probiotic-rich coconut yogurt, alongside smoothie, poké and grain bowls and eggs (the farm scramble is must), chia oats and toasts. Perhaps best known for its amped up, collagen-rich bone broths (like the signature Liquid Gold, a classic chicken broth with coconut milk and turmeric), this Paleo-ish café features a mix-and-match, nutrient-dense menu that’s flexible enough to accommodate almost any dietary regimen. Along with the broths, healthy grain entrées like a beef chili bowl with roasted sweet potato and “spaghetti” and meatballs (made with zoodles) are fan favorites. A self-styled pescatarian restaurant, Gloria is rich with seafood- and veggie-forward dishes that are light but feel indulgent—perfect for those avoiding red meat. Can't-miss dishes include the crab with crisp kohlrabi, a bouillabaisse sabayon finished with nasturtium leaves and the Spanish mackerel with squid ink, cauliflower and trout caviar. Even non-vegetarians love the Ayurvedic-inspired Divya’s Kitchen. While balance and food compatibility are the key focus of the menu, we’d come back for the black lentil soup, vegetable lasagna and carob coconut cake on the basis of flavor alone. You’ll also find many ancient grains like house-milled sorghum, einkorn and amaranth flours, as well as natural sweeteners like dates and sucanat. This fast-casual eatery brings traditional Greek family-style cooking to a modern, healthful menu. Think grilled proteins like lamb, chicken or falafel, lots of veggie accoutrements and sauces like spicy turmeric tahini and Sriracha yogurt. All ingredients are locally sourced when possible and change seasonally to showcase in-season produce. If the idea of swapping tortillas for lettuce wraps sounds like sacrilege, this sustainably minded spot may actually make a convert out of you. Choose from Swiss chard or spinach tortillas (if you can’t quite make the full transition) and fill it with combos like the Hudson Yards, with farro, bulgur, pork, apples and sweet potatoes. This seafood-centric hot spot is already one of our fave healthy standbys, with options like seared molé fish tacos or tuna poké with ponzu and peanuts. And now you can even squeeze in a workout here, too: This year, chef Michael Chernow launched Fit Squad, which invites a top fitness influencer every other month to offer an in-restaurant workout class followed by a healthy, family-style brunch (think a class taught by Nike master trainer Holly Rilinger followed by acai-coconut yogurt bowls and sweet potato-avo toast). 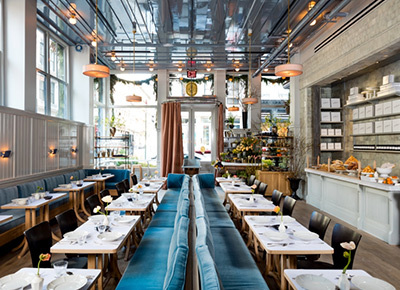 Following a “food is thy medicine” motto, the Upper East Side and SoHo’s Le Botaniste is 100 percent botanical (aka plant-based), 99 percent organic and gluten-free. Founded by the creator of Le Pain Quotidien, Le Botantiste charms with savory “prescriptions” like the Tibetan Mama Rice Bowl (coconut curry peanut butter sauce served over brown rice with steamed vegetables and kimchi) and the Chili sin Carne served over brown rice, beans, sour cream and turmeric onions. Two words: Paleo chocolate. One of NYC’s most popular go-to for Paleos, the chia seed puddings, root mashes and veggie lasagnas are some of the most beloved items off the entirely gluten-free menu (which is also dairy- and grain-free in most cases). Fear not: You don’t have to give up your burger habit in favor of your new healthy lifestyle. The organic options at this local chain (with locations in four boroughs) definitely make the cut when it comes to staying on track, from lean grass-fed, antibiotic-free and hormone-free proteins like beef, elk, bison, turkey and the plant-based Impossible Burger and Beyond Burger to sprouted grain buns and collard wraps and dairy-free alternatives.